Speeding is the number one complaint in many cities and towns. 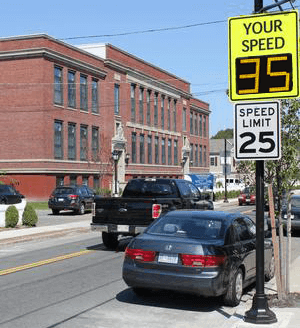 Radar speed signs have proven to be an effective, reliable, and affordable traffic calming solution for reducing speeding drivers. Radarsign offers a variety of options to serve the traffic calming needs of municipalities. And when used with Streetsmart traffic data reporting software option, the radar speed signs provide key data to quantify speeding problems. This allows for intelligent deployment of limited police staff for enforcement. Posting a radar speed sign at the city limits of your main street will send a message that speeding will not be tolerated in town. Drivers will slow down, making your streets safer for everyone. Use a combination of permanent and portable radar speed signs to provide safer arterial streets and neighborhoods. Radarsign has a variety of radar speed sign models and radar speed sign bundles to choose from. Compare our models and see which one is the best traffic calming solution for you. The TC-400 radar speed sign weighs only 20 lbs. and offers the ultimate in portable traffic calming. With the modular design of the radar speed sign and the Go Bracket universal mount, one person can easily install or relocate the TC-400 in about a minute. Using multiple back brackets on existing poles allows a regular rotation of the radar speed sign for ongoing traffic calming. Additionally, it allows same day response to speeding complaints. Just unlock the sign from the pole and move it to another location. It’s that quick and easy…Plus, with the Go Bracket universal mount, the TC-400 can be used in hundreds of places where a speed trailer simply won’t fit – and at less than half the cost. 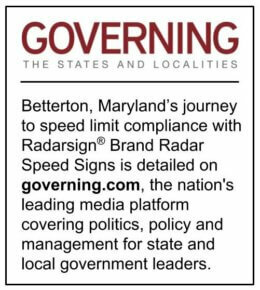 The governing.com article—“How One Small Town Slowed the Leadfoots Down”—shares how the “Maryland community combined cost-effective technology and data analysis to get its speeding problem under better control” by using Radarsign® Brand Radar Speed Signs.